2007 was not a good year for the people of Bangladesh. While an Emergency was imposed in January, depriving them of political rights due to circumstances that were perfectly justified then, lack of subsequent reforms has rendered the past year a painful experience for most particularly when they have been subjected to multiple disasters. The stringent measures taken by the caretaker administration mainly run by former bureaucrats with backing by the military has not provided succor to the common man. After violent squabbles of the political parties, the Caretaker Administration (CA) was welcomed in Bangladesh in January 2007. A year later, perceived failure in political reforms has given increasing voice to opponents to target the regime. Some change should however be expected in March when the Election Commission (EC) is scheduled to finalize reforms though it has yet to hold consultations with the Bangladesh National Party (BNP). The first stage of elections will be held in city corporations of Dhaka, Rajshahi, Khulna, Syhlet, and Barisal. This may require lifting restrictions on indoor politics. The Awami League is planning to hold a working committee meeting in January even as the Chair person is facing trial in courts. However disunity within political parties is preventing them from taking firm steps to register with the EC and under take internal reforms. There are strong murmurs of protest from the teacher and student community in the Universities, particularly in Dacca and Rajshahi. A speedy trial court of Rajshahi sentenced four Rajshahi University (RU) teachers to two years' rigorous imprisonment for violating Emergency Power Rules (EPR) 2007 by bringing out a silent procession on the campus on 21August. They were later released from the Rajshahi central jail on presidential clemency on 10 December. Dacca University teachers wore black badges in protest and held an emergency general meeting on 9 December. Charges were framed on 11 December against four senior teachers and 15 students of the University in one of the two cases filed against them in connection with the August 20-22 campus protests. The political situation in Bangladesh thus continues to remain extremely complex as the government has not been able to raise confidence in political parties as well as the people that it would not attempt to manipulate polity. The process of political reforms in Bangladesh has been slow. BNP and Awami League (AL) have thus been emboldened to issue threats of agitation to free their detained chiefs. While the AL remains united, the Party is considerably weakened with the leader Sheikh Hasina continuing to be under custody. The possibility of a revolt in the Party in case any of the many offences against her are proved cannot be ruled out. The BNP is the other major party which is facing a split. A dialogue with the same is essential. The EC instead of attempting to increase this split as alleged in many quarters by pre-empting invitation to the break away faction should have let the things take a natural course for determination of the leadership's hold on the party. Now it is caught in a piquant situation. Managing the high profile corruption cases against political leaders in the country is likely to pose a problem for the Caretaker Administration in Bangladesh given legal complications and the many loop holes that can emerge in such cases which are never water tight. Now that the judiciary is also independent, there could be limited controls on the same. Thus there is a need to watch the situation carefully in the months ahead as it may impact the Elections as well as post elections scenario in the country with credibility of the political leaders vis a vis the Caretaker Administration at stake. Food assistance to Bangladesh is critical as it is facing a major insecurity on the food front. Indian assistance will facilitate the nation to stave off the crisis and maximum rebate will add to betterment of Indo Bangladesh relations. At the same time it is essential to ensure that there is limited politicization of this issue in Bangladesh as there are reports of some elements not favourably disposed towards India blaming New Delhi for poor quality of rice. SAARC states need to evolve a disaster relief model for mutual assistance devoid of any rancor to benefit from each others capabilities. For instance in this case, though India had a major potential of providing assistance to Bangladesh during Sidr, Dacca perhaps choose to seek assistance from the United States which moved forces from far away Gulf delaying relief. But relations between India and Bangladesh are better than what they were in the past decade or so. The Indian Parliament expressed grief at the devastation caused by Cyclone Sidr, in a resolution on 19 November and observed a moment of silence. This was the trigger for the Indian External Affairs Minister, Mr Pranab Mukherjee's visit to Bangladesh on 1 December. India had rushed immediately required relief assistance like medicines, ready-to-eat meals, blankets, tents and portable water purifiers worth about Taka 11 Crore. The Minister was taken on a tour of some of the critical areas including Barisal. 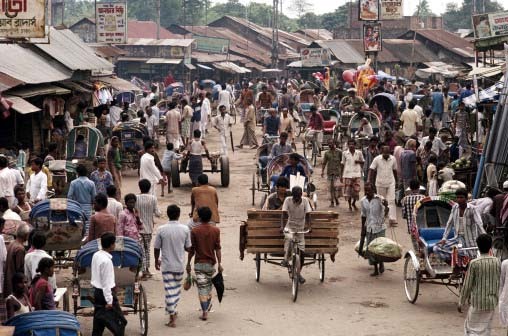 India will also develop 10 severely affected villages of Southkhali Thana under Barguna district in Bangladesh. India will provide 20, 000 tonnes of rice. In addition 5 lakh tonnes of rice will be sold to Bangladesh at a concessional rate by early February 2008. All well meaning South Asians would hope that with Nepal and Pakistan already on the political brink, Bangladesh does not fall in the trap of instability and a viable democratic government with a strong desire for governance takes the seat of governance in Dacca by December.